Well, I suppose that’s why there’s no press release. 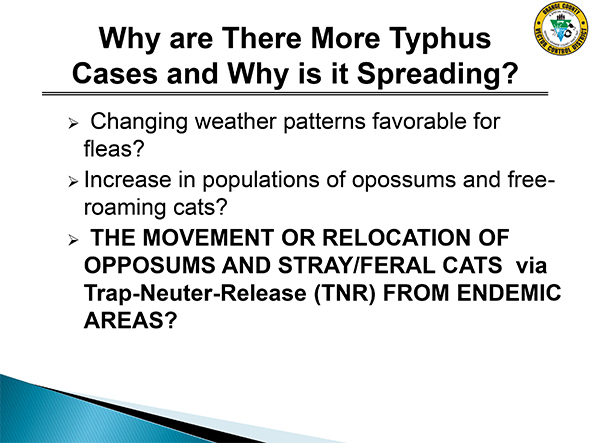 At last year’s Vertebrate Pest Conference, Robert Cummings, OCVCD’s Director of Scientific Technical Services, made a presentation with what I’m sure he considered a rhetorical title: “Orange County Vector Control and the County’s Feral Cat TNR Program: Ne’er the Twain shall Meet?” Setting aside for the moment the fact that Cummings seems to have missed the point of Rudyard Kipling’s poem, the most recent flea-borne typhus data from the California Department of Public Health give his title an ironic twist. Indeed, as the bar chart below illustrates, the number of cases in California during 2016 was the lowest it’s been in six years, with just nine confirmed cases, and significantly lower than the average number of cases during the 2000s. In Orange County, there were just four cases, the lowest since 2006. 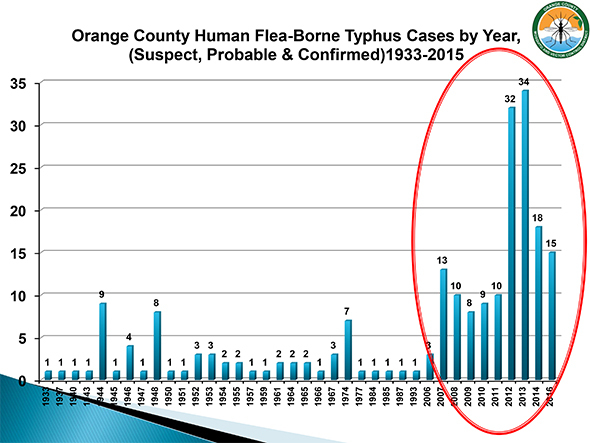 A year ago, even as the number of cases in Orange County had dropped off considerably, Cummings was referring to “more” cases, arguing that typhus was “spreading.” And the leading cause was—as indicated by his use of bold all-caps type—TNR (and “changing public attitudes” about animal welfare more generally). 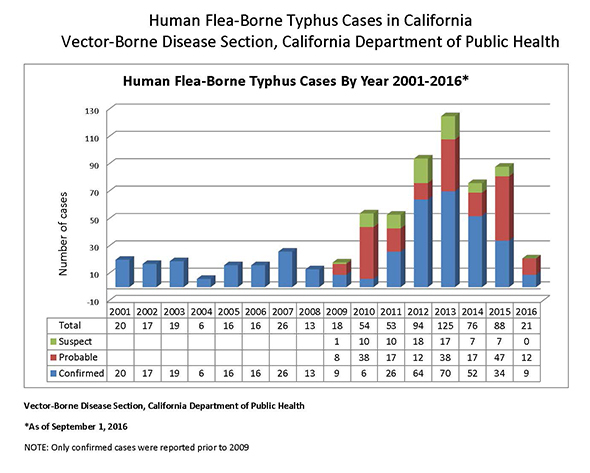 * In fact, between 2013 and 2015, the number of confirmed typhus cases in Orange County dropped 51 percent—while the number of cats returned by Orange County Animal Care increased 28 percent. Yet Cummings went out of his way to argue that the program represents a significant public health threat. And Cummings’ case against cats grows weaker still when one examines the bar chart he used in his VPC presentation (below) a little more closely. He acknowledges, for example, that the data shown include “suspect, probable, and confirmed” cases, but fails to a acknowledge what a considerable share of the total those first two categories can be—52 percent on average—something readily apparent from the 2009–2016 data on CDPH’s bar chart. Also apparent from CDPH’s bar chart: prior to 2009, “only confirmed cases were reported.” What about the pre-2009 data Cummings included in his chart? It’s not clear, but if those are only confirmed cases, then the increase he blames on cats is, in fact, less pronounced than his visuals suggest. Looking back, it seems Cummings’ presentation was inspired less by Kipling’s Ballad of East and West than the author’s Just So Stories for Little Children. * Reviewing several dozen documents obtained through a public records request, I found no evidence of cats being relocated, and only anecdotal references to opossums being relocated. On the other hand, these documents make clear OCVCD’s staunch opposition to—and interest in shutting down—Orange County Animal Care’s return-to-field program.